Blog posted by: Clare Moriarty, 5 March 2019 – Categories: A Brilliant Civil Service, Civil Service Leaders, Skilled people. Across the country, civil servants are improving people’s lives. But in the midst of our hectic schedules, it takes a conscious effort to stand back and recognise what we’re doing. I think we’ve got a lot better at celebrating success over the last few years. Most, if not all, departments, agencies and other organisations have annual awards recognising exceptional performance by individuals and teams within that organisation. The Civil Service Awards, along with the separate Diversity & Inclusion Awards, extend that celebration across the whole of government. And the Operational Delivery Profession Celebration Event, which I had the good fortune to be at recently, recognises the contribution of everyone nominated for the Dame Lesley Strathie Operational Excellence Award and the Customer Service Award. So what’s different about the monthly 'A Brilliant Civil Service' (ABCS)awards? Do we need yet more awards? I’d say yes to that. The ABCS awards were introduced by John Manzoni and the late Lord Heywood two years ago in January 2017. They have a particular purpose: to celebrate outstanding examples of the ‘A Brilliant Civil Service’vision in action across the UK. The vision is built around four pillars that describe how we want the Civil Service to be: Effective Leaders, Skilled People, A Great Place to Work, delivering Improved Outcomes for the public. Every month, the award focuses on achievements against one of the four pillars. So, they are about more than what we do. These awards recognise exceptional contributions to how we work, bringing to life the vision we aspire to. Each month, a Permanent Secretary selects a winner. I was lucky enough to judge the January 2019 award, for Improved Outcomes. It was a privilege to read about the brilliant work going on across government. In 2018 alone, we had more than 900 entries from departments, devolved administrations, agencies and public bodies. The high calibre of entries reflects the truly exceptional standard of what you do as civil servants each day. These, the other highly commended and winning entries, and the countless other commendable nominations from last year, reflect the unprecedented range of ability, support and talent within the Civil Service. Thank you to everyone who has submitted an entry over the last two years. 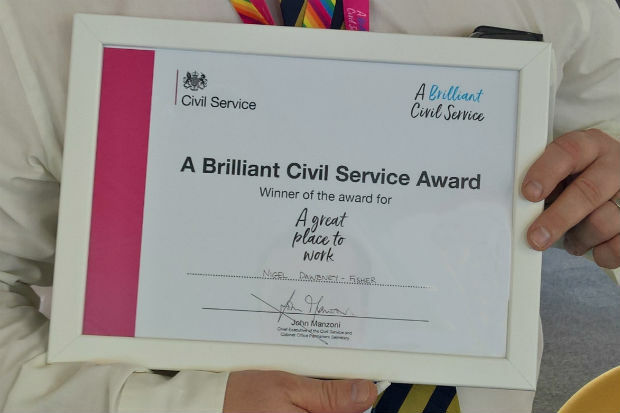 Please continue to use these awards to highlight and celebrate the brilliant work you and your colleagues are doing, and tell us in the comments section below what A Brilliant Civil Service means to you. Submit a nomination for this month’s Skilled People award by Wednesday 20 March. For updates on the 2019 award schedule, please refer to your departmental intranet or contact your internal communications team.